You can walk into nearly any office today, big or small, hi-tech or lo-tech, and you'll find a fax machine. Connected to a normal phone line, a fax machine allows you to transmit pieces of paper to someone else instantly! The stark reality is it is nearly impossible to do business without one of these fax machines today. 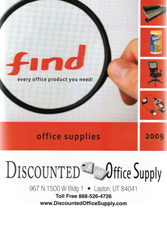 Discounted Office Supply has a wide variety of fax machines to choose from to match any budget and/or requirement. We proudly distribute Canon, HP, Panasonic, Sharp and Brother fax machines of which are all known for dependability. We have a large selection of plain paper fax machines, laser, inkjet and the more technologically advanced multifunction machines that can fax directly from your desktop via a simple print function. Browse our large selection of fax machines today by choosing any of the fax machine categories below. Order your fax machine today and have it delivered to you tomorrow from one of our 32 national warehouse locations.